Less than 1 in 2 parents read to their children says the team behind the ‘National Year of Reading’. Does this ‘Year of…’ or ‘Week for..’ or ‘Day of…’ actually work, or is it just a scam for some well paid campaigners and ad agencies to make some money? I only ever seem to be aware of them after they’ve happened. Coming back to reading to your children, it’s actually its 49%, which seemed quite high to me. 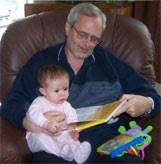 I was never read to as a child and have never read to my children but we’re all avid readers. Honor Wilson-Fletcher (why do they always have such unlikely and posh names?) tells us that it is unequivocally good for us. But their report uncovers some other uncomfortable truths; that most parents put on ‘posh’ vices for heroes and ‘working class’ voices for villains. More worrying is the fact that CS Lewis’s ‘Lion, Witch and Wardrobe’ is one of the most popular reads – according to Tolkein a ‘blatant and naïve’ piece of fundamentalist Christian propaganda (the book is much loved by America fundamentalists). Does reading to your child make any educational difference? The study relies on a YouGov survey of 2,200 parents, and is all a bit hokey. A better source for data is the ECLS study from the US, a massive study on a cross-section of 20,000 children across the US. The results are wonderfully unpacked in Steve Levitt’s marvelous ‘Freakonomics’. Interestingly, having lots of books in your home is highly correlated with educational attainment, but ‘parents reading to their children’ is NOT. I never did feel guilty about not reading Narnia to my kids, as I was always keen that they did more active play and reading on their own. The Baldwin Effect, first put forward by the psychologist James Baldwin in 1896, claims that specific selection takes place on the ability to learn. For some it puts learning at the heart of evolutionary theory. In an interesting spin on the role of learning in evolution, Tadeuskz Kawecki at the University of Fribourg, has suggested that evolution mostly selects against learning. For most animals, it’s better to be plain dumb. We know that learning is a feature of even very primitive worms, with as little as 302 neurons. They learn to avoid disease-ridden bacteria. However, in fruit fly experiments, Kawecki has found that when he put smart, learning flies in with dumber flies, the smart flies died faster. Most species may reach an optimal equilibrium between learning and instinct. Learning, it turns out, produces species that need and over-abundance of experience to survive, making them vulnerable just after they’re born. We humans are the most extreme learners, and it takes years of rearing before we can survive on our own. But as we’ve shot ahead of our equilibrium between learning and survival, there seems to be no limit to our ability to learn how to destroy each other and the very planet we inhabit. The ability to learn may, in the end, have been our death warrant. We know that knowledge and skills need regular practice and reinforcement, preferably spaced-practice, to consolidate retention and recall. Yet our education system at all levels does its best to insert a huge ‘forgetting period’ right in the middle of the year. The July to September holiday, originally designed around agricultural harvesting and fruit picking, leads to serious summer learning loss, undoing much of the good work done in the last term before the long break. A well regarded think-tank, the Institute for Public Policy Research, has recommended five eight-week terms, with two weeks off between and one month in summer. Some weight is given to this new structure as an Essex school, which has adopted the new system, saw a huge hike in their exam results. 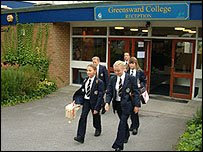 Pupils gaining five good GCSEs at Greensward College in Hockley went up from 70 per cent to 88 per cent. Of course, this is a relatively small piece of evidence, but if it were replicated across many schools, this one act alone would do more to increase productivity in learning than every other initiative over the last decade. Of course, we all know why the long summer break exists – teachers love them. This is the title of a new book by David Crystal. Its enuf to snd Lynne Truss and John Humphries rnd the bnd. 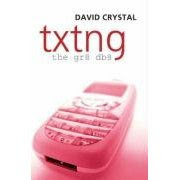 An increasing amout of evidence is emerging from Professor David Crystal, Beverly Plester and research I blogged about in June 97 from the University of Nottingham, that shows texting to be a useful accelerator in literacy. Far from turning people into illiterates, it helps with reading, writing, vocabulary and spelling skills. David Crystal, author of the excellet Cambirge Ecyclopedia of language is one of the few serious linguistics academics to look in depth at texting and the impact of the internet on langauge(s). His 2002 book, where framing in emails, hyperlinks and other phenomena are examined was a good start. His observations on blogging are also interesting. He sees the internet as a window on raw language i.e. language as it is actually used. Not since Chaucer has this been the case. All sort of variants in terms of spelling, punctuation and expressions can be studied in this ‘real’ environment. The $100 green plastic laptop had a Toys R Us feel to it, but the new model, at $75, is stunning. 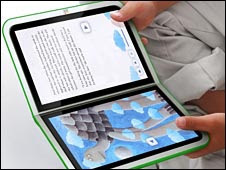 The OLPC (One Laptop Per Child) project has produced a book-like device with two hinged touch screens. It’s smaller, lighter and looks like a book. You’ve got to admire those guys at MIT. Some positive feedback on a report on 'feedback'. There's a damn fine report (FREE) from Will Thalheimer. Check out his well-researched list on what makes for good feedback. What's surprising is the sophistication of the 21 recommendations, especially around retrieval. There's lots to digest and learn from here, whether you're a teacher, trainer or e-learning designer. All hail to Will! Having bust a gut on Guitar Hero but lost very little sweat, who would have thought that videogames would have thrust me into the middle of 'health and fitness'? This is the dawn of casual gaming where games shift in different directions away from their adolescent, adrenaline-rush rut. 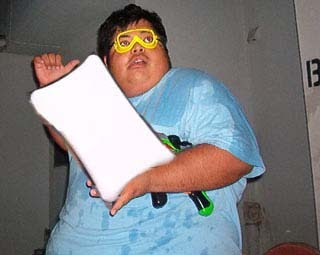 The Wii Balance Board is selling squillions and surprised everyone by putting fitness in gaming. Start with your weight and body-mass index. They’ve had to tone down the language from the Japanese to US version as it said things like ‘You’re Fat!’ Personally, I like the blunt approach to obesity. 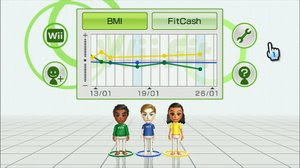 You have a personal profile, so that you can set weight-loss goals and it the tracks your progress. It offers; Yoga, Exercises, Exercise Games and Balance Games As you do your yoga, and try the poses, your performance will be tracked, as your centre of gravity is measured (it’s fundamentally two scales glued together). You are give personal high scores, that drive you towards improvement. But it’s not all about posing and balance. You can do serious gym stuff to improve strength and muscles. Try press ups and the board will measure your strength and when you’ve done 6, unlock the 10 then 20 targets. It really does know when you’ve fluffed a press-up. You’ll break serious sweat with this thing. Then there’s the jogging game – you’ll definitely sweat on this one. And if that ain’t enough, there’s boxing for upper body exercise - skis, snowboards etc. It’s already being trialled in rehabilitation trials in medicine, with disabled patients, elderly patients and so on. We’re clearly at the start of something rather big here. 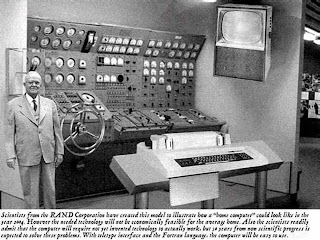 Scientists from the RAND corporation have created this model to illustrate how a "Home Computer" could look like in the year 2004. However, the needed technology will not be economically feasible for the average home. Also the scientists readily admit that the computer will require not yet invented technology to actually work, but 50 years from now scientific progress is expected to solve these problems. With teletype interface and the FORTRAN language, the computer will be easy to use. This prediction, in 1954 shows how wrong one can be! A language teacher was explaining to her class that in French, nouns, unlike their English counterparts, are grammatically designated as masculine or feminine. For example, "House" in French, is feminine - "la maison", "Pencil" in French, is masculine - "le crayon". One puzzled student asked, "What gender is a computer?" The teacher did not know, and the word was not in her French dictionary. So for fun she split the class into two groups appropriately enough, by gender, and asked them to decide whether "computer" should be a masculine or a feminine noun. 2. They have a lot of data but still can't think for themselves. Utterly hilarious spoof training session. I literally fell off my couch laughing at this. Brilliant three minute video where some students stand up in a lecture to deliver a musical complaint to the lecturer about boring teaching. 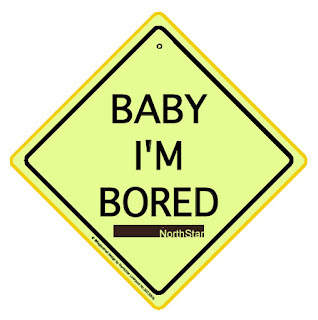 It's fun but really a plea from one generation to another to stop boring them to death. Interesting that the student shows innovation and performance skills then the smartness to get this on Google Video. How many lecturers would be brave enought to record and distribute their lecture? I've got a question -- what I mean is. . . it's just. . .
We come to class everyday it seems, we all fall asleep we've lost all our dreams. But when did we become this way, so disillusioned? So blasé? I can't make the calculation. Can I borrow your TI-83? about the impact that you have on us? to extend your learning on to us and reach! Are you with me classmates? What about that guy over there? Why aren't you taking notes? Don't you even care? This girl sitting over here, she talks a lot in class but her thoughts are never really quite clear. Is it we..who are to blame. to be inspirations to kids like me! It's no wonder why we're here. You must think we only party and drink beer. to be treated as your equals and to dance. The famous George Miller paper ‘The Magic Number 7 Plus and Minus Two’ has turned out to be rather optimistic. In practice, research from the University of Missouri has shown that working memory struggles beyond three or four items. Try remembering the letters IFCMBAIBI. 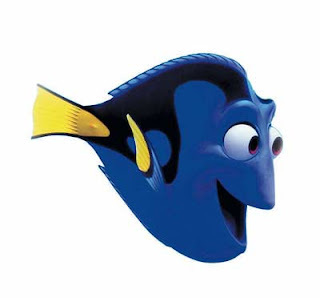 Working memory is what we use most of the time to function and is critical in problem solving and maths as we need to hold several items in the mind for comparison and manipulation. We know that we have as little as three or four working registers so if we store IFCMBAIBI as IBM-CIA-FBI, it’s easy. This article appeared in April’s Proceedings of the National Academy of Sciences. This has important ramifications in learning as it lowers the bar on the possibility of cognitive overload. The lesson is that fewer items need to be presented at any one time and that chunking becomes very important. 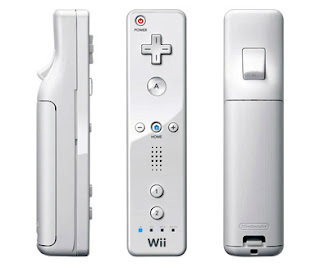 This astounding video shows how to turn the Wii remote into cheap Whiteboard. Forget spending 2-3k on one of these gizmos. This Wiill knock your socks off. With the Nintendo DS, Brain Training, the Wii, other consoles and dirt cheap laptops, we may now see consumer electronics transform learning. E-learning seems to be creeping up from behind into homes via the games industry. In comments after my post ‘BBCs Paxman Demolishes Brain Gym’ I was challenged to provide 10 facts about learning that are scientifically proven and interesting for teachers. The problem I had was whittling it down to ten! Perhaps the most significant fact we know about learning, yet it is almost completely ignored by the 'curse of the course and classroom'. We learn through practice, little and often. Ebbinghaus proved it in 1885, and almost everyone in the learning profession has studiously ignored it for well over a century. Demster reported this sad state of affairs in American Psychologist (The Spacing Effect: A Case Study in the Failure to Apply the Results of Psychological Research, 1988). We forget things quickly and that the most effective way to prevent this forgetting is to practice at spaced intervals over time. Knowledge is easy to learn but hard to retain. Forget this and you condemn yourself to, at best to unnecessary effort in learning, at worst failing to learn much at all – the true story behind most learning effort. This well know phenomenon is extremely common in teaching and training. A lack of understanding about how memory works leads to a lack of preparation of material in terms of size, order and engagement, leading to weak encoding, a lack of deep processing then poor retention and recall. Almost all courses are too long, present material in the wrong way and lead to unnecessary forgetting. Simplify to prevent cognitive overload. Perhaps the easiest and simplest piece of learning theory to put into practice. Chunking means being sensitive to the limitation of working memory. Less is more in learning and distilling, rather than enhancing, elaborating and creating lots of distracting noise, is a virtue in teaching. Unfortunately the ‘song and dance’ act in the classroom is often cacophonous. The order you learn things is critical to how they will be stored and recalled, yet education and training continues to jumble and confuse content. This is critical in language learning, science, maths and indeed, every subject. Learn things in the wrong order and you’ll end up having to unlearn. Once you understand that the things we learn are stored differently, i.e. we have different types of memory, then you’ll be more sensitive to the necessary differences in teaching. We still have far too much reliance on text (semantic) for subjects that need a visual (episodic) approach. You see this everywhere, from text heavy PowerPoints to whiteboards, manuals and hand-outs. Learning does not take place without psychological attention, so setting up classrooms and scenarios that inhibit attention, or distract from learning, is massively counter-productive. I fear that much so called ‘collaborative learning’ falls into this trap. Cramming 30 plus teenagers into a small, airless classroom is no way to encourage attention. There are at least 30 other human distractions, the windows and daydreaming to content with. The bottom line is that most learning is best done on your own or one-to-one. We know that recall is enhanced by learning in the physical context in which one is expected to perform. Yet most teaching is done in alien environments – classrooms ad training centres. We have plenty of proof that work-placed learning needs to be massively increased and non-contextual classroom teaching decreased. From William James and John Dewy through to Kolb and Schank, we’ve had a torrent of theory showing that we learn lots by doing, yet much teaching and training is locked into a over-theoretical, knowledge and not skills, model. There is a barely a subject around in schools ad training that wouldn’t benefit from a boost in experiential learning. The work of Judith Harris (The Nurture Assumption) will change the whole way you look at parenting and teaching. Her revolutioary scientific work showed that most books on parenting and teaching overestimate the influence of parents and teachers, and under-estimate the role of genetics and peer pressure. There are some real and practical steps one can take to avoid the obvious traps. These are largely ignored in education and training. Read the book. This is perhaps the most useful piece of scientific advice for teachers and trainers – dump the snakeoil techniques. These include learning styles, playing music while you learn, Brain Gym, left-right brain theories, NLP, stating the objectives at the start of a course…the list goes on. Many teaching practices are in direct opposition to the psychology of learning. When it comes to education and training, the professions have doggedly chosen unproven pedagogy over prove psychology. This is why so little progress has been made, and why huge amounts of extra funding leads to such razor thin, marginal improvement. There are literally dozes of proven findings in the science of experimental psychology that are largely ignored. This is what the Bristol study I referred to in my Paxman piece is so worrying. I was in China recently and, at an arts performance, witnessed a huge audience answer and chat on their mobiles during the entire performance. I asked whether this was normal, and was told that the rules of public behaviour in China are very different. Privacy is rarer and people will happily answer and chat on their phones, even in cinemas while watching films. I’ve been told that this is also common in India. You also notice in China the fact that people stare at you a lot more and are very direct when they ask you questions, about whether you’re married, have kids, your salary and do on. It set me thinking. Is technology creating a pendulum swing towards PUBLIC, as opposed to PRIVATE behaviour? Is the thing that marks out the difference between older and younger generations the degree to which they accept public domain behaviour? Take telephony. It was the domain of private homes or enclosed telephone boxes – those lovely, red soundproof things. We're now bombarded by a cacophony of ringtones and conversations in trains, airports, pubs, restaurants and in the street. People stop walking in front of you as they answer calls. It’s all gone public. Take banking. We used to dutifully queue up inside banks to deposit and withdraw money. Now we’d rather queue outside in the street than go into a bank, even if there's a teller available. We prefer the public domain and the machine. Older generations are very suspicious about giving out their email addresses and personal data. Youngsters are blasé about this. They recognise that giving up some privacy is part of the deal for receiving free stuff. 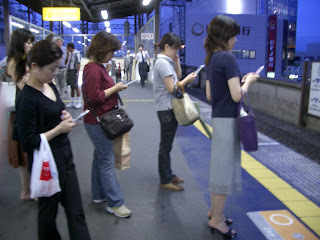 Social networking is taking your life public. Are we becoming a more ‘public’ society? I think so. I see lots of kids in Brighton wander about, greet other with hugs and handshakes, hang out in parks and on the beach. In general they seem to live their life in a much more open and public manner. There’s a confidence among them that is often taken for aggression or arrogance. Similarly online. They’re just that much more open and social, happy to share experiences, photos, stories, videos, email addresses and so on. What can we learn from this? We baby boomers are essentially a private lot. We squirrel it all away, get the house, grab a pesion and never come out. We love command and control, learning management systems, timetables and courses. We love to lock learners up in classrooms and courses. But we may have to loosen up the structures so that social goals are part of learning and work. This means loosening up on the ‘curse of the course’ and all of that ‘talk and chalk’ stuff, that demands undivided attention at a set time. We need to free courses from the tyranny of time and location. Blends of learning must accept that some of the learning needs to be out there and not in the classroom or course. We have to blend into online knowledge management, social stuff and real work tasks, and see it as something people can do at home or somewhere other than the school, office or training centre. V-learning - just do it! Yet another internet phenomenon has show us the way forward in learning. Mr Kedersha has made over $100,00 this year from his instructional videos on Metacafe, which pays him on hits. YouTube has led the charge but other sites, some of which pay contributors, such as ExpertVillage, VideoJug, Wonerhowto, howcast and Graspr offer similar content. There's a lesson here for every school, college, university and organisation. 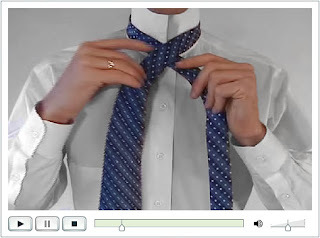 Record and distribute video clips. In all of these organisations there are literally thousands of tasks to be learnt. Take some of your budget, buy a camera, train someone on how to prepare, structure, shoot and edit video - and learn a lesson from this phenomenoa - just do it! Media sharing should be the next big thing in learning. It's a moral outrage that teachers, lecturers, instructors and trainers don't record their stuff. It's largely embarrassment, because most of it is so dull, but surely we in the learning profession can LEARN from those in every other medium; that the good stuff should be caputured, distributed and used. And don't believe all taht baloey about IP and copyright - let's face it, if most of ite were tested by the market, it would be worth zilch. Get the market to decide who should be rewarded. Schools would benefit greatly from a bank of brilliant downloadable video clips. This would be a resource well worth creating in each major subject - especially umeracy and literacy. And is there anything worse than the university lecture - surely they should be doing their students a favour by allowing them to view lectures more than once? Similarly in training. Got a procedure, concept, product, value? Shoot it and distribute. Fish around on these sites and look at the top videos. Want to save yourself some money, learn how to cut hair. Do quick mental arithmetic? Save energy? Improve your memory? It's all there. Of course, the trick is keep it short, simple and snappy. Get your expert, brief them to do 10-20 slots, quickly, o excess fat, rehearse it once, prtending to shoot, give feedback and do it again.